Panthers News · Nov 26 Hello Upper State! The Panther defense harassed, bullied, and overwhelmed the Central Eagles offense for 48 minutes this past Friday night. With temps in the low 40’s and sporadic rain showers, the Panthers stayed hot on the field. The Abbeville defense controlled the game from the opening kick, never allowed a point and collected six Central turnovers in a 39-0 rout. The Panthers punched their ticket to their 4th consecutive UpperState Championship game with the win. The Panthers forced a 3 and out early and got their offense rolling. Dylan Beauford hit a 38 yard field goal to get the scoring started in the first quarter. The defenses seemed to be getting a feel for each offense until the 2nd quarter when the Panthers opened up the flood gates. After a Central punt, the Panther offense marched right down the field and Courtney Jackson (12-79-2) punched in his first of two touchdowns to put the Panthers up 10-0. JD Moore (15-69-1) broke loose on a 34 yard TD scamper with 3:39 to play before the half. A Central turnover gave the Panthers the ball right back and a crazy string of events then took place. The Panthers were content to kick a field goal and take a 20-0 lead into halftime. The wet ball was bobbled a little on the snap, Hunter Rogers collected the ball, scrambled to his right and found Joc Norman in the endzone for a touchdown. The Panthers line up for the extra point, and the exact same thing happened again. This time Rogers rolls to his left and finds Courtney Jackson in the endzone for a two point conversion. The Panthers led 25-0 at the half. Ja’Bryan Sanders flashed speed, power and vision with his 71 yard kickoff return for a TD to open the 2nd half. Later in the 3rd quarter, Courtney Jackson punched in his 2nd touchdown of the game from four yards out and that ended the scoring on the night. The Panthers ended the Eagles season with a 39-0 shut out. Panther defenders collected four interceptions, one each by Quadarius Gullibeaux, Jahlyn Schuler, David Cobb and Titus Paul. Central’s leading rusher, 1,300 yard back JR Reid was limited to one yard on seven carries. Reid was injured late in the game and helped off the field, and carried to medical help by a couple Panther players. A true sign of respect and sportsmanship. 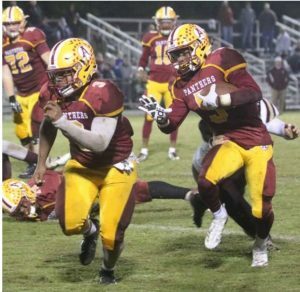 Central mustered 86 yards rushing, most of which came late in the 4th quarter against reserves. Chapman, Central’s QB finished 4 of 15 passing for 27 yards, no touchdowns and four interceptions. The Panthers defended their home turf for the 33rd consecutive time and moved their win streak to 20 in a row.